1) Viki's Granola - Granola has a lot of health benefits - Viki's is sodium free, gluten free, dairy free, kosher with no sugar added, no preservatives and using whole grains. It's also great for kids to make their own trail mix (by adding some of the cranberries, nuts and fishy crackers shown. 2) Nuts - It's a good idea to bring dry food that eliminate the need for ice packs or coolers. A handful of cashews or almonds or pecans are a great snack that will give an energy boost. 3) Blueberries - It's a superfood that kids often love - no utensils required. 4) Tuna and cracker pack - If you don't want to load up a bunch of sandwiches and have to worry about keeping them cold, this is a great alternative. The packs even come with a little spoon for spreading. 5) Honestly Cranberries - I was surprised to learn how much added sugar there is in packaged store-bought cranberries. This brand doesn't add extra sugar. It's a nice, natural snack. 6) Aqua Ball - For kids who just won't drink plain water, this drink doesn't have corn syrup or artificial sweeteners. Stevia Leaf Extract and a little natural flavor makes this appealing to kids without corn syrup that is loaded into a lot of juices. 7) Goldfish Crackers - Because who doesn't love this baked snack? Also easy for kids to grab on the go when they cannot be bothered with getting off the slide to take a lunch break. 8) Apple slices with peanut butter - Add a little protein without the need for refrigeration. Kids love to dip things, too, and apples are the ideally healthy dipping device. 9) Go Organically Fruit Snacks - I quit buying fruit snacks for my kids a while back because, well, they typically just are not healthy despite having the word "fruit" in them. Loaded with corn syrup and artificial flavors, they just were something I phased out. However, when I got some Go Organically fruit snacks to try out, I was glad to see it was something I could feel ok giving to my kids. They do have sugar, but it's organic cane sugar. That's what I always look for now on labels so that I can avoid corn syrup and artificial sweeteners like Splenda, Sweet & Low, etc. These are made with organic juices and puree blends and it really tasted good - not artificially over sweet. My kids were excited to taste test them and they were gone before I knew it. 10) Lorna Doone - Just because. I'm not a big cookie eater, but this is one that I can't resist. It's a good portable one for a picnic. No chocolate or chocolate chips to melt. No creme to ooze out. Just a good travel cookie. 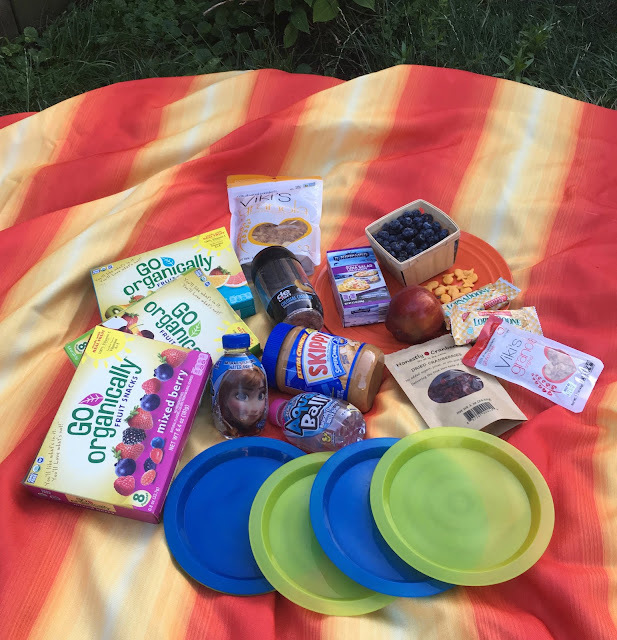 So, pack up that basket and head out for a hike or a trip to the zoo or the park or the beach and stock up on these 10 recommendations that will help keep the kids full and happy on your excursion! ***Vicki's Granola, Aqua Ball, Go Organically Fruit Snacks and Honestly Cranberries were provided for purpose of a review. I was not compensated for this post. All opinions are my own.